This could be the re-located Locust Lawn Ski Area which was originally located in Danvers, MA and relocated to Topsfield when the Interstate 95 was built. In any event, this rope tow area on an approximately 150 foot vertical slope operated from the 1950's in the 1970's on Witch Hill in Topsfield. It had one rope tow, one wide slope, and a narrow woods trail. Here's the topo map of the area. 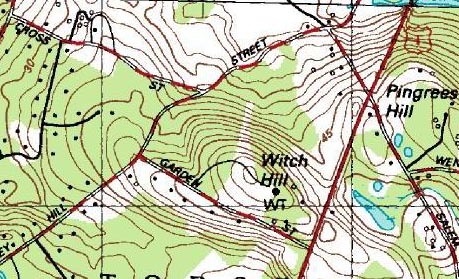 Notice how the slope cuts down the north side of Witch Hill. There were two entrances to the area, which I'll get to in a bit. The area closed in the late 1970's, likely due to liability reasons. Here's an overhead view of the area today. Notice the slope is still open and clear, and if you use your imagination, you can see the trail in the woods. Now for the entrance to the area. The original entrance, a dirt road at the summit of Witch Hill on Garden Street, was blocked off by the owner. Then, the only way to get to the area was an old woods trail/road off of Rowley Hill Street, near the intersection of Cross Street. The location is marked here on the map. The location of the entrance is a bit difficult to find, but if you drive slow on Rowley Hill Street you should be able to find it. Here's the road, notice a power pole in the woods. I had found the area with my parents on October 13, 2003. All following pictures are from that day. Looking up the slope from the bottom. 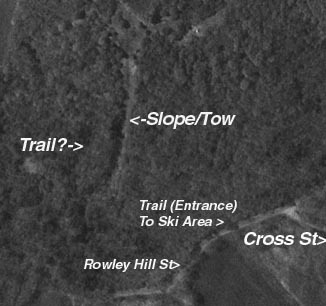 Bob Humphrey: "I believe that the Locust Lawn Ski Area referred to on the site was in fact located on the opposite side of the hill from the later slope. The Locust Lawn Slope was located on the South West side of the hill, where as the later slope was located on the North East side. I grew up in Topsfield and as a boy in 1955 I learned to ski there. I vaguely remember skiing on the old Locust Hill Slope for perhaps one or two seasons, before the slope was moved to the North East side. I and my family were all members of the Topsfield Ski Club. We spent many wonderful days skiing there. Back then it was a very active club with many ski enthusiasts. The club maintained everything. Each fall there were one or two major outings where everyone got together for work weekends when we would mow and trim the hill, tune-up the old engine that ran the tow, inspect and if necessary repair the old rope. These outings were a lot of fun complete with food and drink. The club had annual dues and also raised operating costs from bake sales and Ham and Bean suppers etc. I believe it cost a dollar each time you skied too. The hill was leased from the old Wheatland Farm in Topsfield. 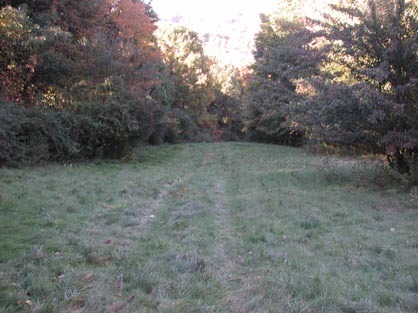 There were two points of access, one from the top of the hill via an old farm road, until that section of land was sold to a private owner who closed the road, and the other that Chris mentions from the bottom of the hill. It was a good sized hill, perhaps 800 ft. supported by a rope tow with two trails. The main trail was a nice wide trail with a pretty good incline. The other trail was a narrow woods trail and as Chris mentions was on the left as viewed from the bottom. Originally the rope tow was powered by an old Chevy or Ford Ambulance type vehicle located at the top of the hill. It was jacked up in the rear and the rope was driven by one of the wheels. It had a throttle cable arrangement that allowed the engine to run at ample RPM's to operate the rope at a pretty good clip. There was an "A" frame arrangement at the bottom with a wheel mounted on it that the rope ran around. The "A" frame was mounted on a skid which was adjustable by come-along to increase or decrease rope tension. There was a safety gate at the top which was wired to the ignition switch of the old Ambulance. The gate was located ample distance from the vehicle so that if tripped the engine would shut down thus causing the tow to stop. It was a neat old rig and the heat was always left on "high" so that when you got cold you could climb in to warm up. At some point in the early to mid sixties my father was President of the club, a job as I remember he didn't much care for. It was like any other club where the officers were elected every couple of years. The club had a President, Vice President, Secretary, Treasurer, and I believe an operations manager. In order for the area to run there were a select few who took on the responsibility of running the tow. If those people were not available or didn't feel up to it the tow did not operate. I can remember the phone ringing constantly during the winter months with someone inquiring if the tow was running. I think it was this aspect of the deal that my father disliked the most. The operations manager, if there was such a position, was filled by a great "Old Yankee" by the name of John Nutter. He was an amazing engineer/mechanic type who could design and build things from next to nothing and have them operate flawlessly. At some point in the mid sixties he got hold of an old electric motor from the General Electric Plant in Lynn Ma. where he worked as an engineer. Somehow he managed to get this large heavy old motor home to his old barn where he had an incredible workshop. From there he went to work converting the old motor into a power plant for the tow. The club built a fairly good sized building at the bottom of the hill to house the motor and to accommodate a supply room and warming area. I do not remember how the club got this heavy old motor into the hill but it must have been quite a feat. The motor ran flawlessly for a number of years and was used until the last days of the club. 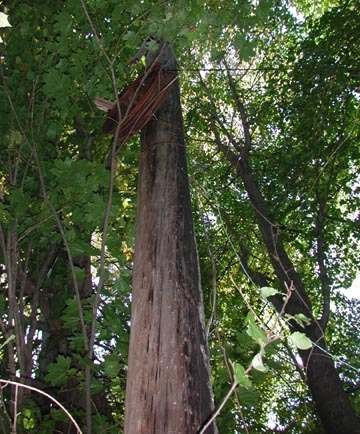 The rope tow was supported by a number of old telephone poles. Each pole had a car rim mounted on a spindle complete with grease fittings, probably designed and built by John. The poles also had large spot lights mounted on them to facilitate night skiing. Back in the 50's and 60's when the Boston area saw "real winters" with lots of snow the area ran almost every night. I can remember racing home from school to get all my home work done before diner so that I could ski that night. The club did not have any grooming equipment so after each major storm most of the club members would get together to pack out the trail by side stepping from bottom to top. I can remember that the tow was not "fired up" until the whole slope was packed. If you wanted to ski you had to do your part. I remember the old Topsfield Ski Tow with great fondness. It was a great family/community area. Many of us kids who grew up in the Topsfield area learned to ski there. It was a nice local area run by local people who loved to ski." J. English: The Topsfield Ski club hill was called Wheatland's Hill in the 1950's as it was on the property of the Wheatland family. There were two ways to access it, from the top from a hilltop field off Garden Street and from the bottom by a trail thru woods and brush. I forget the name of the lower street, the one that Garden Street goes off of. The tow had an old car or truck at the top for power and a movable A frame thing at the bottom with a system of pulleys for tension. Eventually there was a safety gate at the top, just a cord across the track attached to a plug that when pulled out stopped the tow. My Dad, Ben English, Sr. was very active in helping keep the slope clear. He would take his Graveley 2-wheel tractor with cutter bar over to help mow. I think the hill was started in the 1940's as my mother mentioned his helping there during WW II or shortly after. The comments about the trails thru the trees to the left, looking up are accurate. If I remember correctly the trees were mostly red cedars. Once we built a jump made just of snow. I was impressed with being able to jump about 30 feet from it. The ski club had races on the hill in the 1950's. I got a trophy once, which I gave to Vicky and Harry Carpenter a few years ago for donation to the historical society. Anyone know what has happened to it? In the same race Jeep Mann won the boy's trophy. 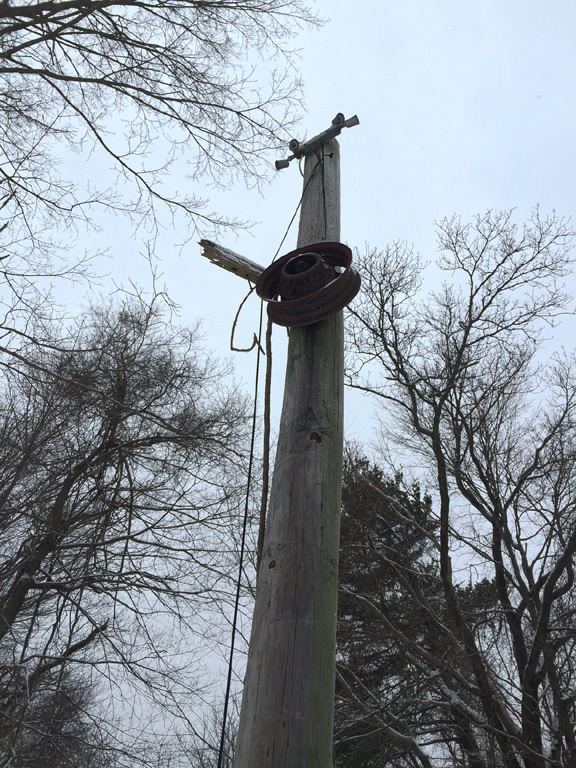 A rope tow tower and electrical wiring about 1/3rd of the way up, deep in the woods now. 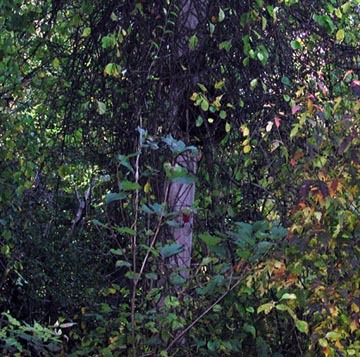 A second and last standing tow pole near the summit, very much overgrown in vines. Chris Warren: "I remember skiing at the rope tow in Topsfield Massachusetts around 1968-1971. I didn't know until just a few minutes ago that it had a previous history as Locust Lawn in Danvers. I was only about 12 at the time, but I remember it as being known as the Topsfield ski club. I could be wrong about this. It had one rope tow, seemed to be fairly long and fairly steep. It had one open slope, with a lot of small trees dotted around near the summit, and it had one or two trails in the woods, on the left looking from the base. You had to hike in on a trail from the street carrying your skis- you couldn't see the place from the road, and it wasn't marked, you just had to know where to look. I had a lot of fun there, and I'm thankful to the people who made it possible. I think we paid a dollar a day plus the membership dues." I found the slope in question this past Saturday. It is located pretty much as I described before, and the trail in from the road (Hill St) is easy to find and easy to follow. 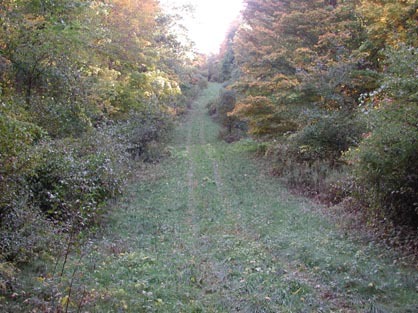 The slope itself is still skiable, though narrower than it originally was due to vegetation growing in from the sides. Apparently the property owner is mowing the field at the top (good view to the north, but couldn't see Rte 1). 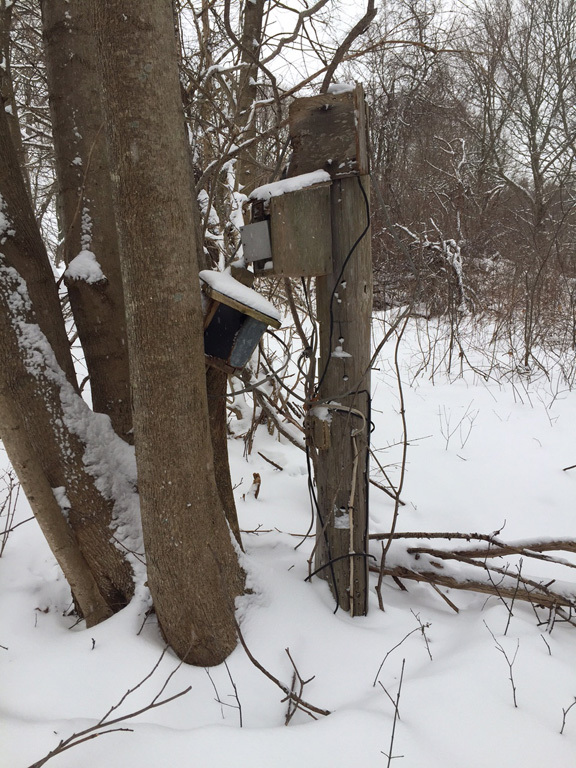 The motor and shed are long gone, but I did spot one post for wiring, near the top, skiers left. Also someone has been horseback riding up the slope. I'm friendly with a member of the local running club who has used the slope for hill training on occasion in the past few years. Looking down at the area from the summit. No trace of the woods trail could be found. 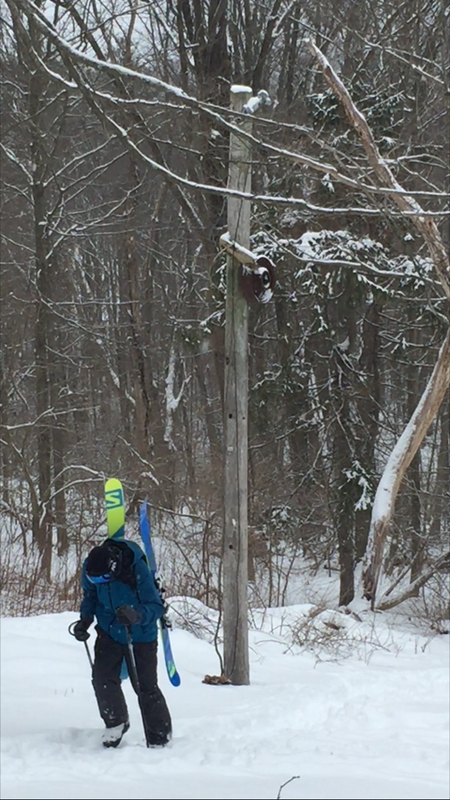 Chris Carney: I don't have many details but there was a ski hill served by a rope tow with an electric motor in Topsfield, MA. 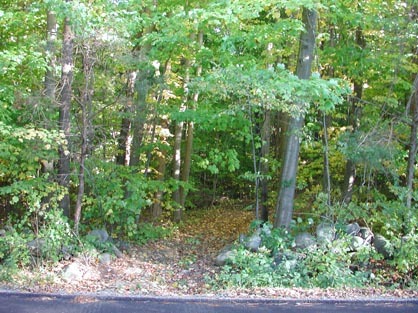 The hill was located south of Garden street, west of Rte 1, east of Hill street. Run as a private club. I remember fall work weekend clearing the slope and driving stakes to attach Christmas trees as wind blocks. I skied there in the late 1960's or early 1970's. My recollection is that it closed in the 1970's due to liability insurance concerns. Does anybody else have any more information? Please let us know!